Photo printed with permission from Ryan C.
These two shots were taken on South Eads Street right by the Crystal City Metro station and close to the nightlife of 23rd Street. 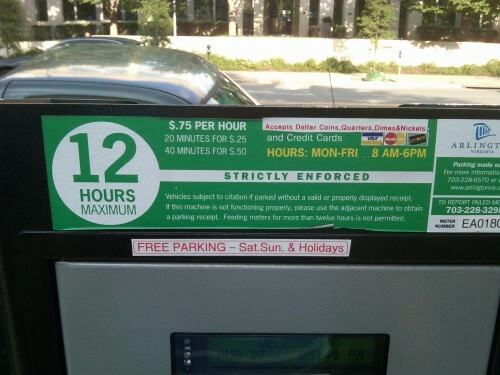 While the big sign states that you can park for 12 hours, the sign above where you actually pay for your meter says you only have to pay from 8am – 6 pm or a total of 10 hours. 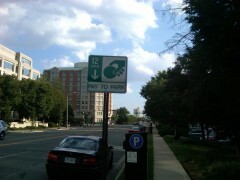 Smart business by Arlington County or epic fail? Of course, it’s all in the details, and this is why you always check the meter before loading it down with change for the day. I don’t understand what the problem is? You only have to pay for 10 hours, but there is still a 12 hour limit. Imagine you pull up at 8am and park all day… at 6pm you can stop feeding the meter, but at 8pm your time has expired, you have to move. Similarly, if you pull up at 6pm, you’ll have to move by 6am the next morning, even though you never put a dime into the machine.